Ask any journalist, and you’ll find out just how overfilled their inboxes have become in the past decade. In fact, we asked about 1,300 writers, editors, and contributors for some specific numbers. This is what we found. Forty-three percent of top-tier publishers receive between five and 50 pitches per week, and 57 percent receive between 50 and 500 pitches per week. At the same time, nearly seven out of 10 writers and editors write one story at most per day. While close to half of editors and writers have a turnaround time of just one to two days, almost a quarter have queue times longer than six days. Now ask any PR professional, and you’ll hear them say that pitching isn’t easy. With so much content and such little demand for it, publishers have a distinct advantage in the relationship between public relations professionals and journalists. 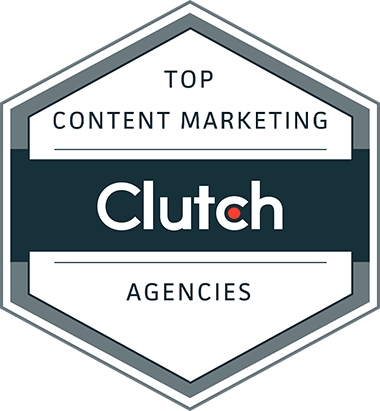 Our team consistently earns media placements and mentions from some of the top publishers on the internet. We’ve conducted internal analyses on our performance in the past and have received valuable information. However, we still wanted to learn more. 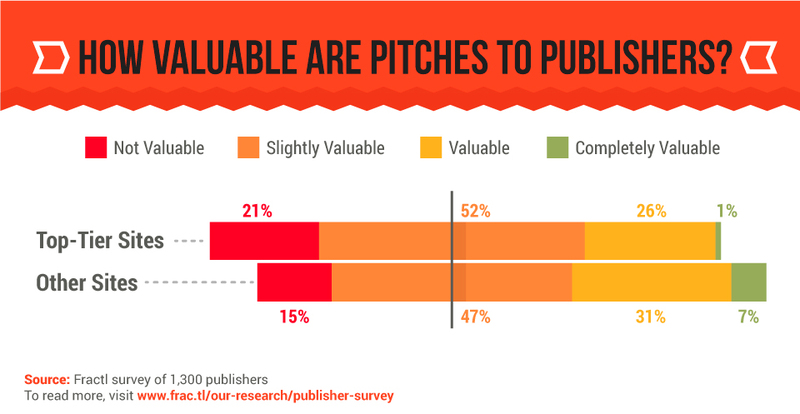 Our survey of 1,300 publishers, writers, and editors reveals the worth of a pitch and some tips to help PR professionals increase the value of theirs. 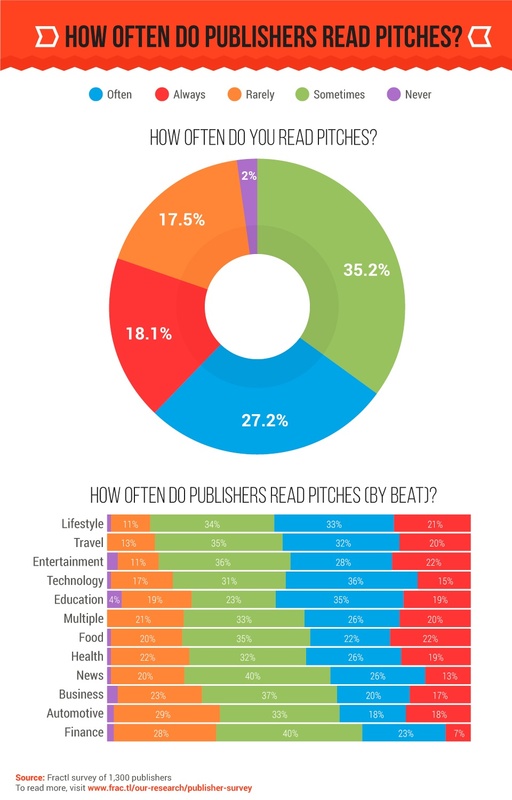 How Valuable Are Pitches to Publishers? While lower-tier sites are more likely to find your pitches valuable or very valuable, most (nearly four out of five) top-tier publishers find that pitches have at least some value. How Often do Publishers Read Pitches? Overall, there’s a pretty good chance your pitch will at least be read. Forty-five percent of respondents revealed they often or always read pitches, while only two percent admitted they never even open the email. Broken down by vertical, Lifestyle and Food writers and editors are most likely to always read your pitch, while Automotive and Finance writers and editors are least likely to read your pitch. Don’t be discouraged, however, if your content falls into the latter categories. The same writers and editors also chimed in on their pitching preferences, which will ultimately increase your odds of being seen and getting that reply. From properly timing your emails to forming the perfect pitch, keep reading for some exclusive insights, and be sure to check out our “Tell-All Guide to Digital PR” for an in-depth road map to media relations. Photos, mixed media, and videos are the most commonly published content formats by publishers in 2016. Looking ahead, while all three are still content formats publishers would like to see more of, infographics and data visualizations will see a higher rise in demand. In fact, infographics currently have the highest demand by publishers. What Are Publishers Not Looking For? A lack of research before pitching is one of the biggest mistakes media relations professionals can make; in fact, 80 percent of publishers say a pitch irrelevant to their beat is a common reason for declining a pitch. It’s also worth noting that being too self-promotional or even too boring is a common reason for having your pitch turned down; roughly 56 percent of publishers will decline an overly promotional pitch, while 48 percent will reject a boring one. What Makes a Pitch Grab Their Attention? Timing: The best time of day to send pitches is early morning to noon, and the best time of the week is Monday through Wednesday. Subject Lines: Sixty-six percent of publishers agree that an email’s subject line is the most important factor for whether they open an email. Email Length: More than half of writers and editors across all beats prefer pitches that are between 100 and 200 words. Read more of Fractl’s research for valuable insights on media relations and digital PR.